With just one small suitcase, $10 and a large brass tea urn, 9-year-old Isabel Belarsky and her parents traveled from Leningrad, Russia, to New York's Ellis Island. "In 1929 the journey took many weeks by train and boat, but I remember everything like it was yesterday," says Belarsky, 90, of Brooklyn, N.Y.
Hit the play button, above, to listen to Belarsky's story of coming to America. Belarsky's account of her childhood in Stalin-era Russia and her family's migration to the United States is one of more than 1,700 Ellis Island oral histories recently posted on Ancestry.com. In the 1970s, the National Park Service began taping immigrants' memories of the ocean crossing, their reasons for immigration and tales of everyday life in their country of origin. From 1892 until the 1954 closing of the federal government's immigration station in New York harbor, more than 12 million immigrants were processed at Ellis Island. Many arrived in the early 1900s, with the largest representation of oral histories from Italian and Russian immigrants. Ancestry.com is offering free, permanent access to the oral histories as part of its fee-based immigration collection of ship passenger lists, passport applications, and citizenship and naturalization records. "Even if your own ancestor isn't included in the collection, these firsthand accounts make the paper records come alive," says Todd Godfrey, the website's senior director of U.S. content. "It's powerful to listen to a peer describe day-to-day life so long ago." Isabel Belarsky describes the anti-Semitic attitudes of her childhood and the hardships of sharing a one-bathroom apartment with five families in Leningrad, as well as happy summer visits to the countryside. "It was almost impossible to leave Russia then," she says, but her father, an opera singer, was able to obtain a six-month visa to teach in America. The family traveled by train through Warsaw, Berlin and Paris before boarding a New York-bound ship in Cherbourg, France. 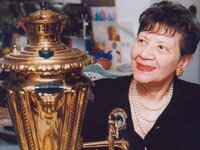 In Warsaw, customs officials forced her father to pay $10—nearly all their money—to crate the heavy tea urn. "We carried that samovar wherever we went," Belarsky says. "Today it sits in my living room in Brighton Beach." When the ship landed at Ellis Island in February 1930, an uncle failed to appear with the necessary $500 bond. "We spent the night at Ellis Island, where there were 40 cots in each room but no sheets," says Belarsky in her taped account. "We were fed a bowl of soup and allowed 10 minutes of fresh air. They counted us every time we entered or left a room." After a thorough physical examination and a hearing before a judge, the family was allowed to go. For years, the oral histories were available only to visitors to the Ellis Island Immigration Museum, where they can still be heard. Each history is unique, says Diana Pardue, chief of the Museum Services Division. "We've all read the story of immigration, but it's a radically different experience when people talk about their family, sing early childhood songs or tell about their adventures on the boat or the train," she adds. Although the Ellis Island Oral History Program still seeks participants, the numbers of immigrants who are able to visit the museum's broadcast-quality studio are dwindling. At first many participants profess to remember nothing, Pardue says, but after a few questions, memories pour out. "Once you get them started it's hard to get them to stop," she adds. "Many cry because it's the first time they've ever talked about this part of their life." In one recording Lawrence Meinwald's voice begins to crack as he remembers his first sight of the Statue of Liberty in 1920 as a young Polish boy. "My father and I dressed and went to the deck. There were people of all denominations, some on their knees making the sign of the cross, Jews in their prayer shawls as we were passing the Statue of Liberty." By the end of the story, Meinwald, who has since died, is sobbing. On a recent trip to Ellis Island, Terri Hooper, 49, of Port St. Lucie, Fla., was unable to find records of her Irish ancestors but was fascinated by the oral histories of other Emerald Isle immigrants. Single women, she learned listening to accounts, were required to marry or have a man meet them before being released. "A lot of them married right there on Ellis Island," she says. "Can you imagine traveling all that way, your family spending so much money and then you weren't accepted [into the country]? You couldn't just pick up the phone and call someone to say come pick me up at the dock." Many Americans who passed through Ellis Island retain a warm regard for the place, despite the hardships of the immigrant experience. And that samovar in Isabel Belarsky's apartment? "It's the only treasure we brought with us to America," she says. "And when the time comes, I plan to donate it to the Ellis Island museum."